Art– All I can say is WOW! Truly James C. Webster has been blessed bountifully by the art gods. You simply can do nothing more than awe at every page. The colors must also be noted as they create a symbiosis with the inks and pencils that bring everything to glorious life. It’s rare that one finds a book full of lush painted tapestry that you can only describe as a masterpiece but Dusu is that, if not more. 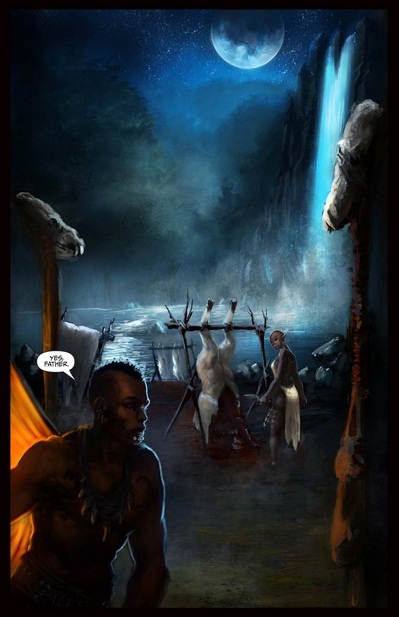 Mythology- This first issue introduces us to the culture of the Galemren a race of Dark elves, we learn the basics of their culture such as hunting, gathering, spirituality and even some of their myths. Sebastian A. Jones and Christopher Garner manage to give me just enough that I’m intrigued enough to want more, which is a very good thing! 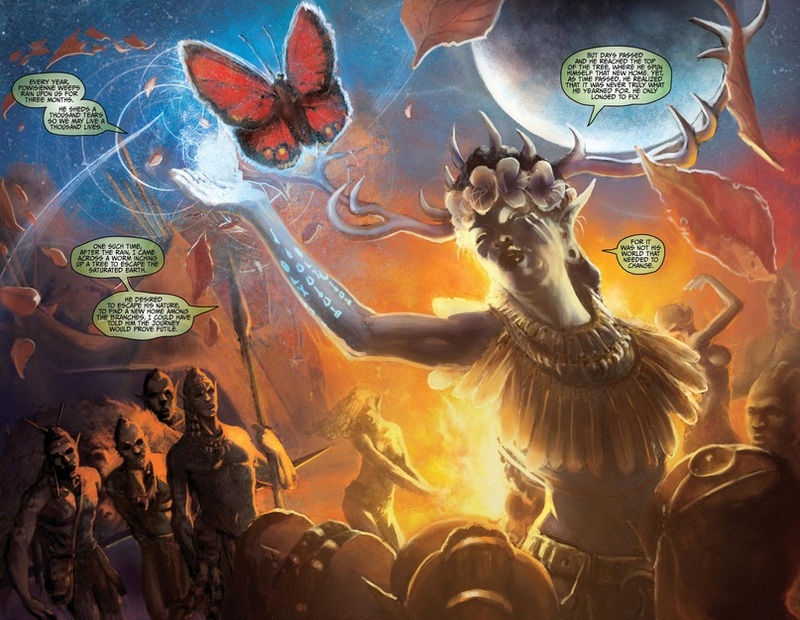 There’s also a bounty of additional information on the mythology and history of this fictional land and people. It’s free right now so go get it! 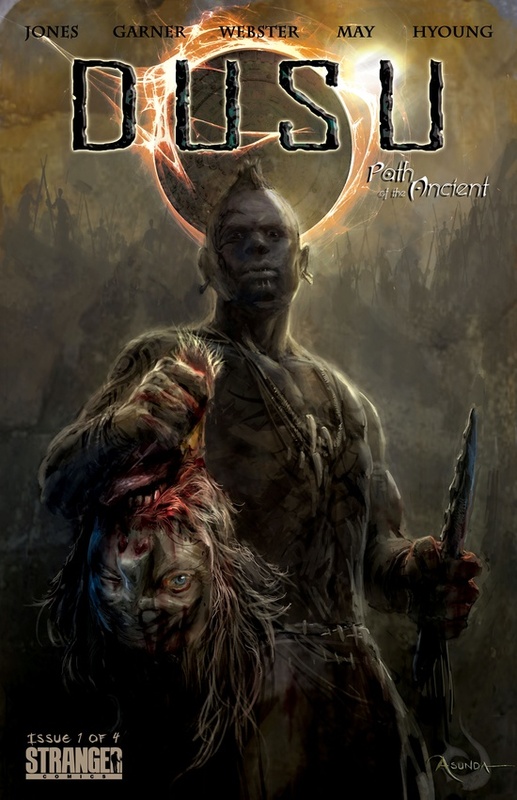 Black Hero- Dusu is a dark skinned human in a world not his own, possessing a destiny greater than himself while trying to live up to his father’s expectations and battling both sibling rivalry and jealousy. Dusu is very relate-able especially from a teenage perspective. These are clearly defined human behaviors and with the accompanying emotions that hopefully will pull fans in and keep them. Story- Dusu is exactly the break black comic fans need from Marvel and Dc Comics with its accessibility and simple complexity. If you’re tired of all the crossovers (from DC and Marvel) and the need to head to Wikipedia constantly to enjoy your comic then Dusu is here to save you. Preview- This issue also includes a few preview pages that literally leave me on the edge of my seat while sending all kinds of creepy chills down my spine. Good times ahead for this one! Metaphor- I liked the story of the worm who desired a new home during the rain and upon finding it soon realizes that he is the one that needs to change not the world around him. This is clearly speaking of Dusu who himself needs to change to better fit into his world as opposed to finding a “special place” for himself. Family Dynamics– This is another thing I enjoyed, Dusu is a tale of family, and coming of age mixed with African/Native American spirituality and culture. Sibling rivalry is also present as is living up to your parent’s expectations, being yourself and trying to fit in. This human aspect of the tale really pulled me deeper and made me empathize with Dusu. There was even a hinted brush of romance. Action– I know a great many fans hate slower paced tales and luckily Dusu straddles the line that gives you just enough action without compromising the story elements. You have blood, guts and fists so action junkies should be pretty happy. Free- I’m recommending all who read this review to take this link to view Dusu for free on Itunes or for computer users go here to Graphicly. Dusu is gorgeous and enchanting and you owe to yourself to experience it! Buy it– If we want to keep Dusu coming then show Marvel and DC by putting your money where your mouth is and but Dusu Here. Not enough Press- Dusu is one of those books you feel heartbroken it’s not getting the coverage it should. Thanks to Hannibal Tabu for the recommend on this one because before he gave it a shout out I didn’t know it existed. Not Enough– You’re going to enjoy this so much you won’t want it to end.